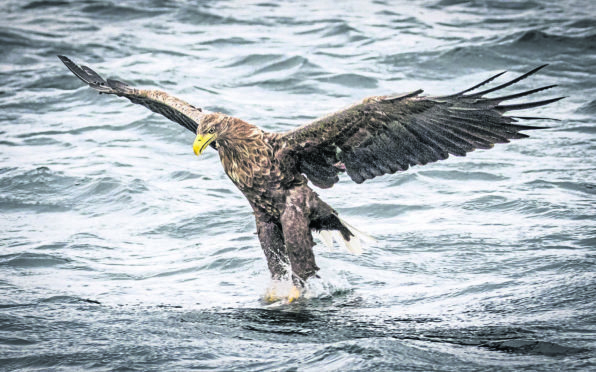 A white-tailed eagle swoops down on a fish off the Isle of Mull. Ryan Wemyss captured images of the eagle catching a fish in its razor-sharp talons during a group photography excursion. The construction firm site manager was on a boat trip with ten other avid nature photographers on Sunday off the Isle of Mull. The 50-year-old said he was “blown away” by the huge bird, which he says had an eight-foot wingspan. Ryan, from Conon Bridge near Dingwall, said: “We were on a chartered boat and visited different spots off the island’s coast. “It was the first time I’d seen that type of bird in the wild. It must have had about an eight-foot wingspan, it’s absolutely amazing. Andrew Nicholson, 53, from Culloden, was also on the day tour with Ryan and caught some other breathtaking images of the birds, which he had never seen before. Wildlife tour guide Andrew said: “In the morning it was quite overcast and windy, to the point where they were uncertain whether to take the boat out. “But the guys who run the excursions are very experienced and luckily the weather cleared up. “The morning trip was amazing because we had just left the harbour when we came across our first sea eagle. I had seen golden eagles before but not white tailed ones.